The smell of fried food is an unmistakable one. You know when you are getting close to it. You are either blasted with the sweet aroma of freshly fried funnel cakes or knocked to the ground with the smell of fries cooked in old oil. 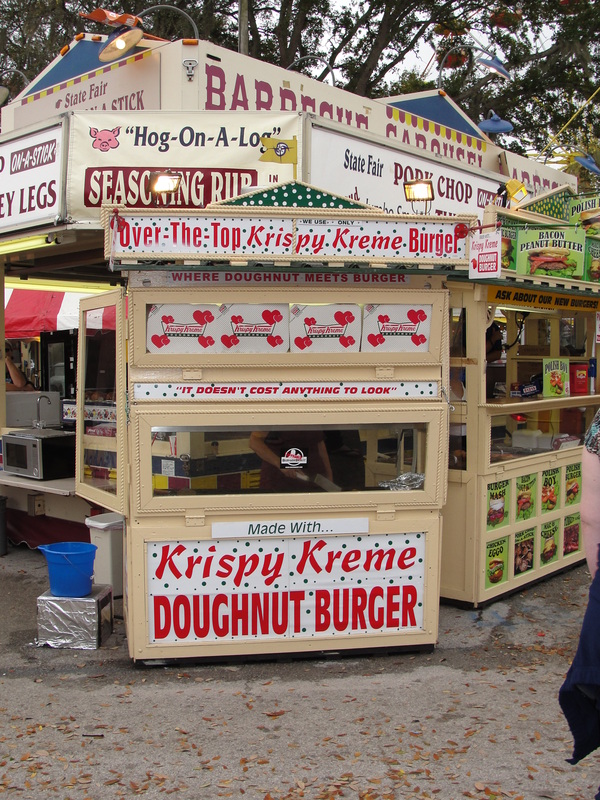 The Florida State Fair wafted aromas that were somewhat in the middle. I did smell freshly fried funnel cakes but I also got smells of gross fries. While walking around, we decided to try two fried items – neither of which we have had before. And after being extremely disappointed in them, two items we will never have again. As I may have mentioned a time or two before, I have a soft spot for Fried Oreos. I absolutely love the sweet smell and flavor that they produce. Sadly, I did not get any at the Fair and there is no telling when I will have them next. Yes, the offered them but we were here for the crazy and outrageous. As we walked around, we saw signs advertising Fried Butter, Fried Bubble Gun, Fried Kool Aid and more. None of these items sounded even remotely good so we bypassed them all. 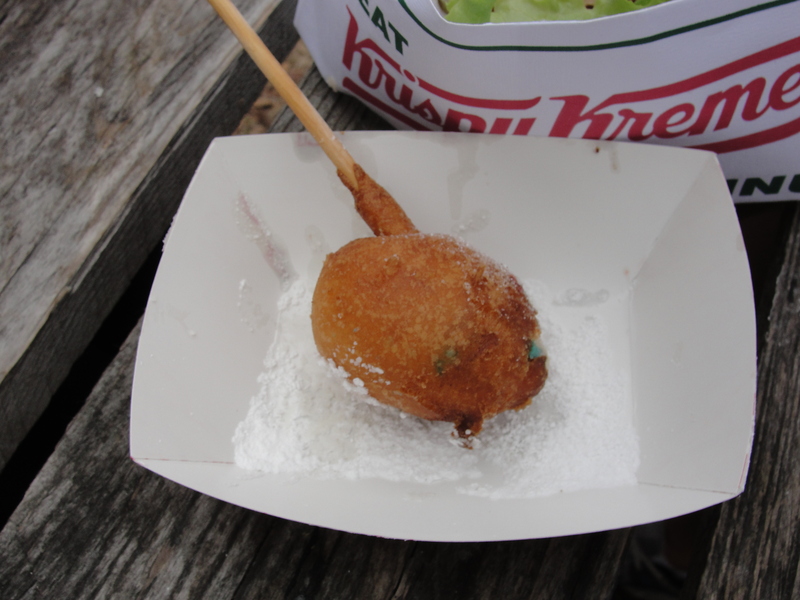 We opted to try two items – Fried M&M’s and the Krispy Kreme Burger. We have seen the Krispy Kreme Burger on many tv shows and figured we had to try it once. 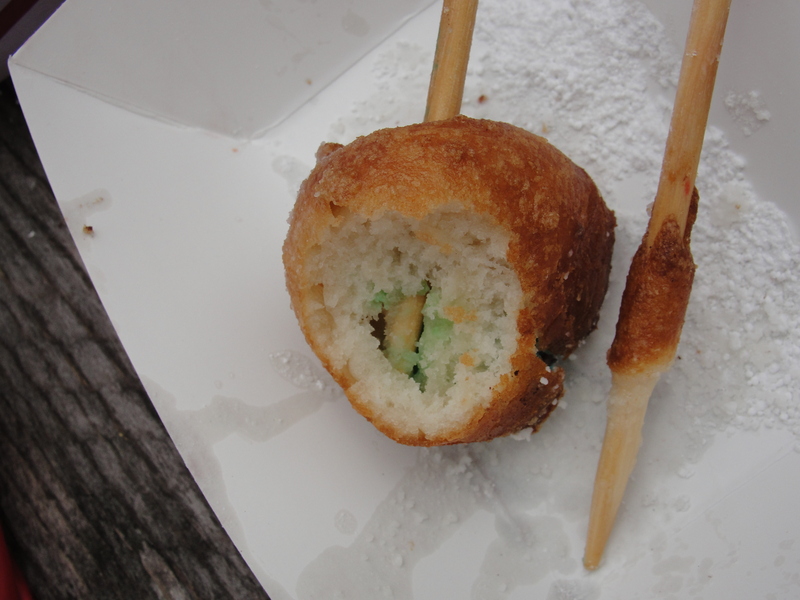 As for the Fried M&M’s, I’m not sure what the thinking or reasoning was there. I can surely say that both of these items were so not good. The Fried M&M’s had a quite strange presentation. Two balls of dough on a stick were served to us with just a bit of powdered sugar on top. As they were handed to me, the lady explained that the M&M’s were within cookie dough and then fried so they would be whole. What? Did I order M&M’s or Cookie Dough and M&M’s. I thought this was really weird but was so beyond the point of being hungry, just took my food and walked away. I had no idea what the Fried M&M’s might taste like. I took a bite and did not get any M&M’s at all. Instead, I could taste an under flavored fried dough on the outside and a soft & mushy sweetness on this inside. This did not taste like cookie dough at all and the consistency was enough to make me want to puke. After taking another bite, I found some colored dough but no taste of M&M’s at all. What a waste. The Krispy Kreme Burger is a traditional cheeseburger but, is served on a warmed-up Krispy Kreme doughnut rather than a bun. Also included on the burger was bacon which I did not realize until it had been served to me. We opted for the toppings on the side since we would be sharing and Taylor does not like lettuce/tomato. 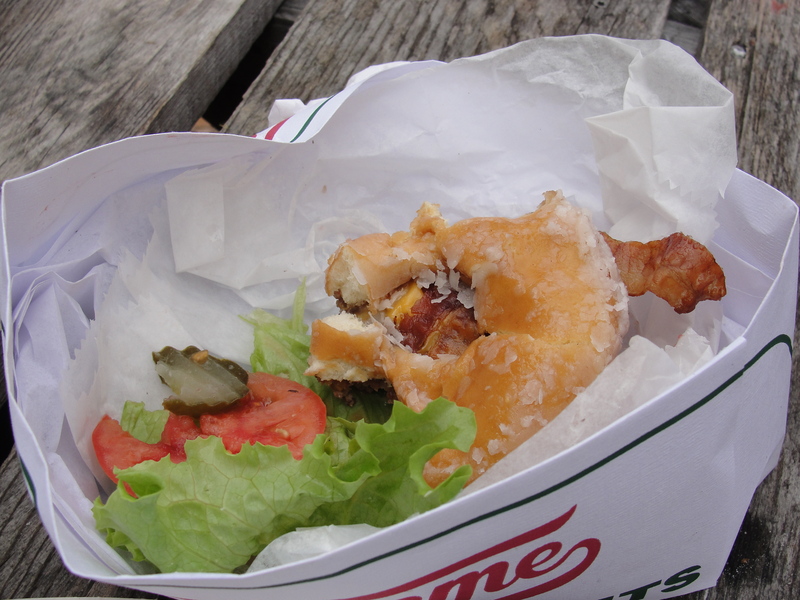 The burger is served in a Krispy Kreme hat and is actually pretty small in size. It did smell quite good but I did not have high expectations for this burger. I find Krispy Kreme’s to be so overly sweet and just gross. I took a bite of the burger and chased it with a bite of lettuce & tomato. I luckily was able to find a spot of the burger that was without bacon. The burger tasted exactly how I expected it to taste. The Krispy Kreme was very sweet and sugary. The fact that they warm it up on the grill enables the exterior sugar frosting to begin to melt. 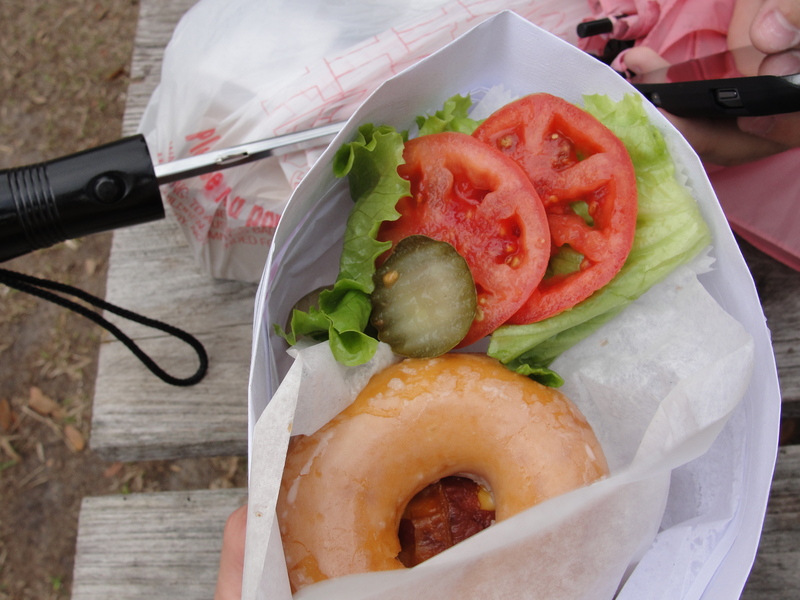 The doughnut itself was very soft and surprising held the burger. The burger and toppings were basic burger & toppings – no thrills here – just another burger. I really didn’t care for the combination of the Krispy Kreme and the burger – the sweetness of the Krispy Kreme just did not mesh well with the beefiness of the burger. I had two small bites and was totally over it. I ended up being just as hungry as I was before we ordered these items and out $11 bucks. I can’t even say that my expectations were too high and crashed to the ground with these fried items. My expectations were really low so the fact that both items were not good, came as no surprise to me. I really wish these items would have been better or that we would have selected better items to try. We left the fair and I felt extremely unfulfilled. I went in expecting to shove my face with deliciousness and left without really feeling that – minus the great Arepa Con Queso of course. The Florida State Fair had the potential to be a Foodie’s Playground but rather, it was simply a Fried Wasteland.